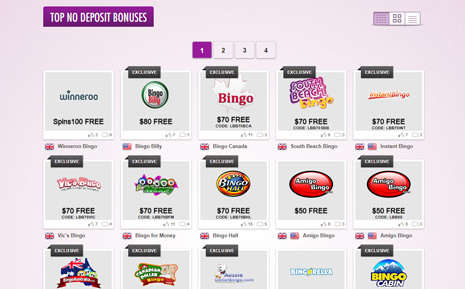 If you've yet to check out our sister site, NoDepositBingo (NDB), perhaps it's time to pay a visit to the all-inclusive library, delivering an extensive compilation of bonuses, promotions, bingo-related news, and detailed reviews of several online bingo sites. We encourage you to use it regularly as a resource for informative details regarding all your online bingo-related needs, conveniently located and easily accessible in one place. In addition to providing both newcomers and seasoned players with tons of information, the site is proud to provide a haven for individuals to check out the latest offers across the internet, which allow them to play for free... hence its name. 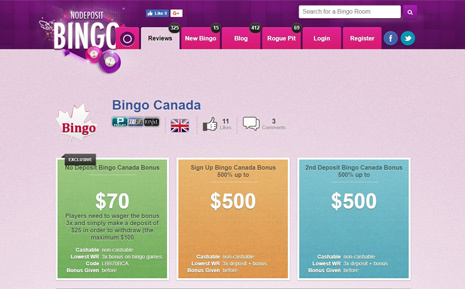 Frequent bingo players are well-aware of the way sites work, with the vast majority offering a deposit-based or no deposit bonus as a signup incentive. While the latter is less frequent, especially in its true form (some have hidden terms attached that make them not-so-free), NDB has got you covered with true-blue freebies, the obvious choice for those looking to register to a new site. NDB's signature colors are purple, pink, and white, and you'll notice this vibrant scheme immediately upon launching the site. In the top, right-hand corner of the homepage, there is a designated box where you can enter the name of a particular site you have in mind, and read a full review, if available. A total of six tabs grace the top of the screen as well for instant access to reviews, new bingo, blog, rogue pit, login and registration options. Let's dive a little deeper into each of the given tabs. Selecting the 'Reviews' tab will launch each of the sites loaded into NDB's database, of which there are hundreds available. They are numbered, and listed in alphabetical order, with icons listed on the righthand side, which can be used to launch the review, like it, or access the official bingo site. 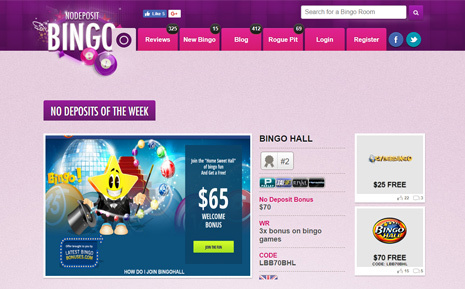 Head to the 'New Bingo' page for a spread of the latest websites to hit the online bingo community. This page is updated regularly as new offerings pop up. For trending news in the bingo industry, both online and land-based, feel free to browse the 'Blog' section, which includes the latest debuts, closures, enticing promos, contests and more! The final tab, aside from the login in and registration options, which are self-explanatory, is the 'Rogue Pit.' NDB can help steer you in the right direction as to which sites should be avoided, whether that be due to it having some kind of warning, being blacklisted, or closed. Those with a warning are those that are recommended to proceed with caution, while those that have been blacklisted are a little more serious and should be avoided at all costs. Blacklisted sites have been labeled this way due to highly immoral business practices, including, but not limited to, a lack of licensing, and hosting pirated games. As for the remainder of the homepage, visitors have the opportunity to catch a glimpse of the current week's no deposit offers, top no deposit bonuses, and the latest blog posts. Be sure to check it out!